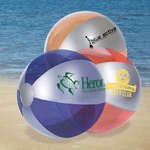 Entertain kids and employees and show off your brand with personalized beach balls from Promotion Pros. We offer a variety of beach ball options, so you're guaranteed to find exactly what you want for your next company outing! Custom multi colored beach balls, luster tone beach balls and beach ball and towel combos are great to use as quick thank yous to customers who visit your company with kids in tow and can also be given to staff members and their children. 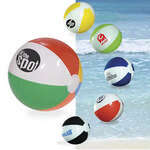 The beach ball is an interesting and enjoyable way to create brand awareness, especially outdoors; at the beach, in the lawn, in the backyard, or at pool parties. It reaches a size of 12”, when inflated. The beach ball is an interesting and enjoyable way to create brand awareness, especially outdoors; at the beach, in the lawn, in the backyard, or at pool parties. It reaches a size of 16”, when inflated. 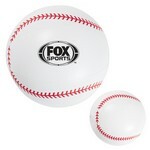 Our 16" Baseball Beach Ball features customization ability and allows adding brand logo and message to Promote your Brand. 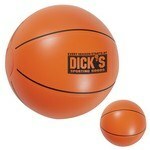 Our 16" Basketball Beach Ball features large imprint area to allow creating amazing Company Logo Products. 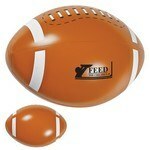 The 16" Football Beach Ball features customization ability to allow creating impressive Promotional Logo'd Products. 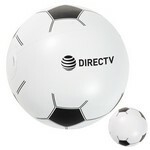 Our 16" Soccer Ball Beach Ball features customization ability to Promote your Brand with company logo and message. The beach ball is an interesting and enjoyable way to create brand awareness, especially outdoors; at the beach, in the lawn, in the backyard, or at pool parties. It reaches a size of 20”, when inflated. The beach ball is an interesting and enjoyable way to create brand awareness, especially outdoors; at the beach, in the lawn, in the backyard, or at pool parties. It reaches a size of 24”, when inflated. 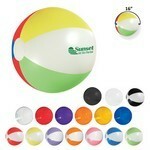 Be it the beach, a resort, a park or a picnic, a fun outing is never complete without the Classic Beach Ball in tow. Imprint your company logo on these affordable giveaways and be an instant hit with the recipients. 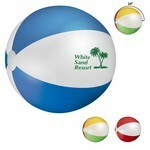 Our 16" USA Beach Ball features customization ability for excellent Company Logo Products. 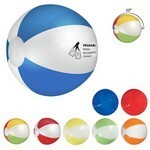 Check out the Luster Tone Beach Ball, loved at pool parties, beach resorts, and more. 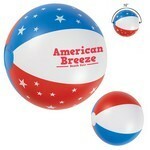 Promote family fun down the shore with this beach ball! 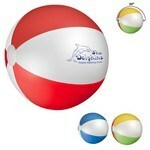 Measuring 10-1/2" dia, this Luster Tone PVC beach ball features alternate silver and transparent colored panels.